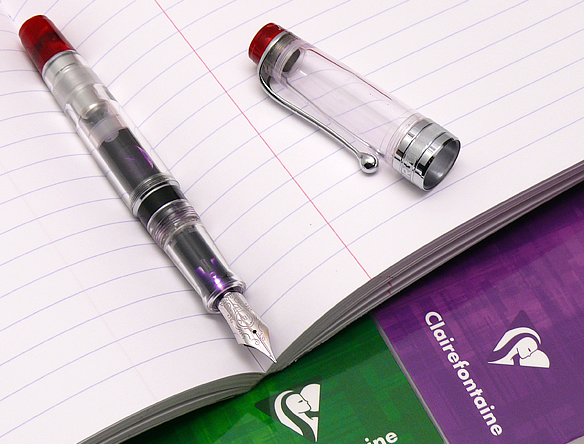 Staedtler Triplus Fineliners are definitely on my list of favorite writing tools! I enjoy using these vibrantly colored fine tip pens for everyday handwriting, doodling, marking up my paper planner or relaxing with my Clairefontaine coloring book for grownups. 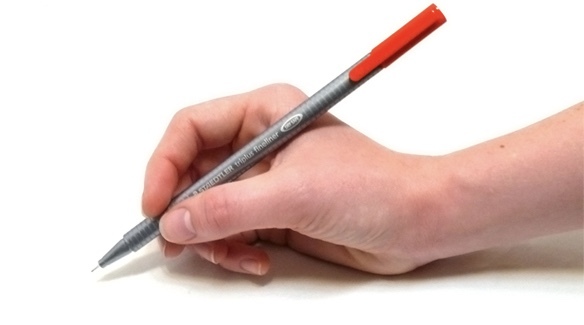 Triplus Fineliners are porous point pens with a superfine tip that’s metal clad to help the tip maintain its shape. 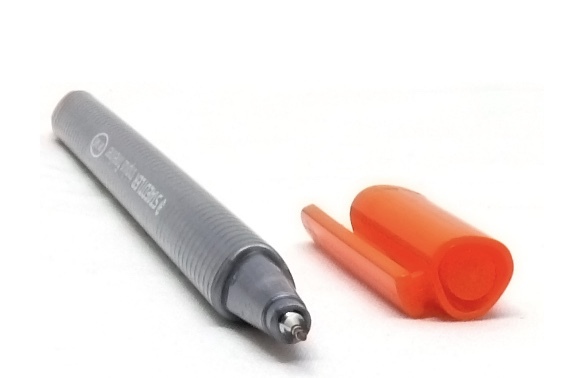 The 0.3mm tip is finer than your average felt-tip pen which makes them ideal for small handwriting, detailed and precise drawing or for coloring in small spaces. 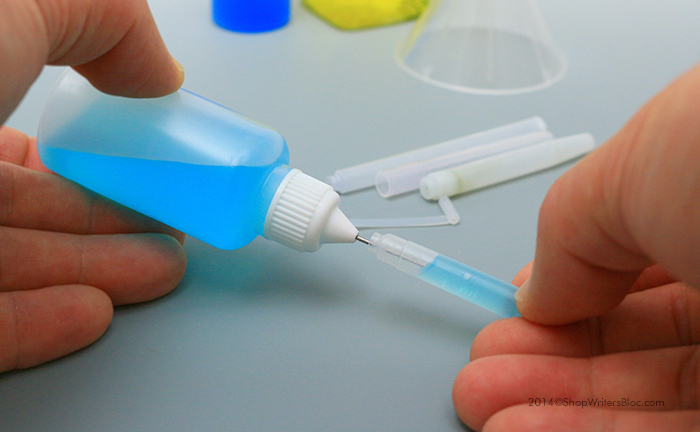 These pens have what is called a Dry Safe feature: they can be left uncapped for days without drying up (Test ISO 554 – except neon colors). 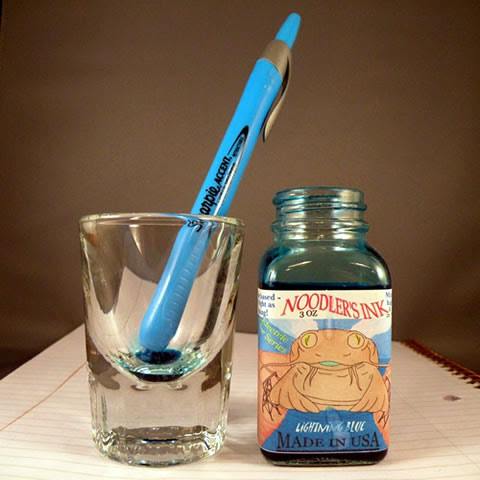 We did our own test of this ability and you can read about the results here: Staedtler Pens Dry Safe Feature Test. 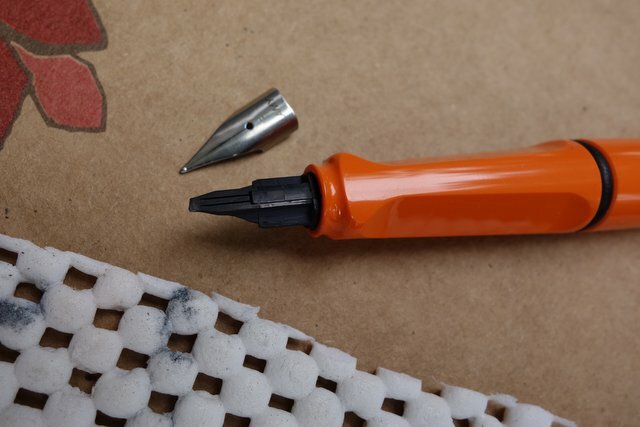 Of course, for best results, we do recommend putting the cap back on your pens after you’re finished if you can remember to do it. 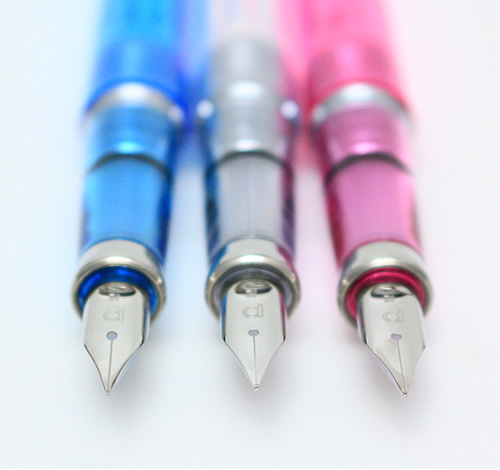 The long slender barrel of Triplus Fineliner pens has a triangular shape for a comfortable and ergonomic writing experience. The grey colored barrel is made of durable poly propylene and since it’s triangular it won’t roll off your desk. 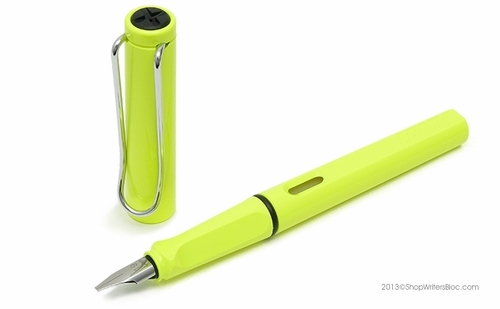 It has a plastic snap-on cap that matches the color of the ink inside the pen. 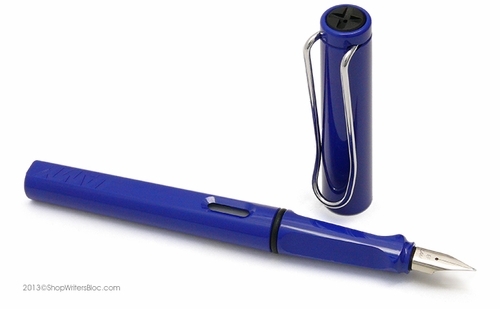 The cap can easily post on the top of the pen and since the cap is light-weight it won’t throw off the balance of the pen while you’re writing. The cap does have a clip that’s about 1 1/2″ in length. 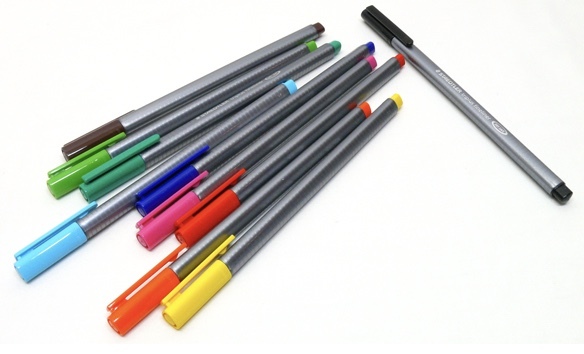 Fineliners are about 6 3/8″ long when capped, 6″ long when uncapped and 7″ long when the cap is posted on the end. 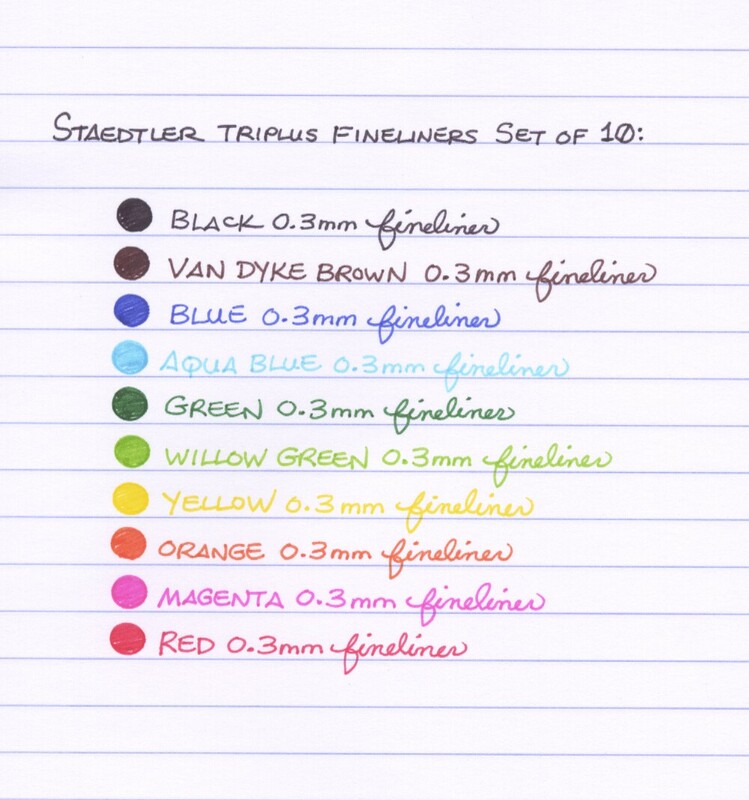 Staedtler Triplus Fineliners have water-based ink that can be washed out of many types of fabric which means they are not waterproof or water-resistant. The pens are not refillable. 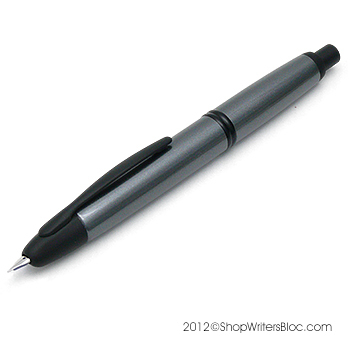 They are airplane safe: automatic pressure equalization prevents the pens from leaking on board aircraft. 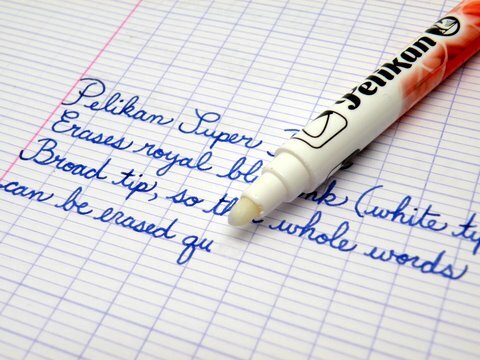 From my own experience, the ink does not feather or bleed through most kinds of paper. The ink dries quickly so even though I’m a lefty I don’t smear it much. 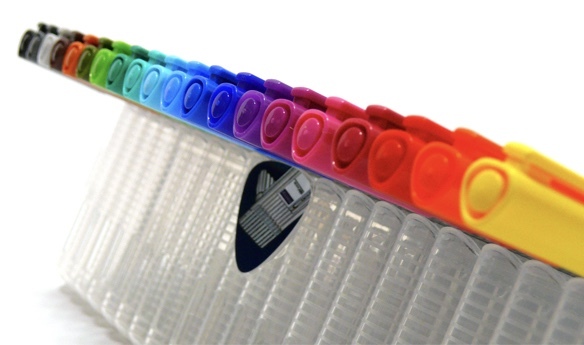 If you buy them in a set of four, six, ten or twenty, Triplus Fineliners come in a plastic storage case that can stand up when it’s open so that you conveniently have your pens both organized and within easy reach. 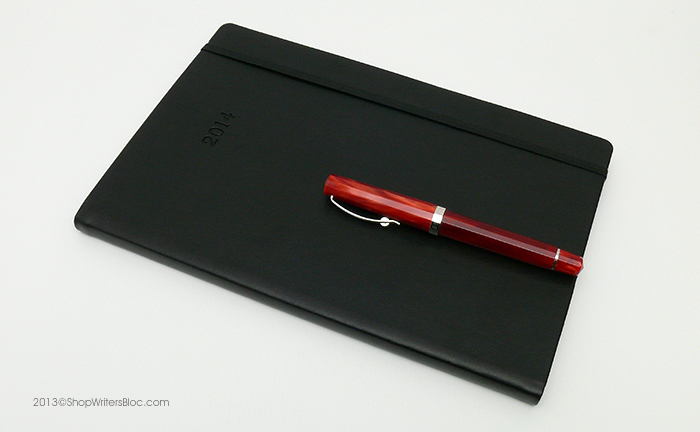 As of writing this blog post, there are around 30 of these pens that are available as single colors: yellow (1), red (2), magenta (20), light carmine (21), bordeaux (23), tuscan red (260), carmine (29), blue (3), light blue (30), aqua blue (34), cyan (37), orange (4), peach (43), green (5), willow green (51), lime green (53), french green (54), green earth (55), olive green (57), violet (6), dark mauve (61), lavender (62), delft blue (63), mauve (69), brown (7), van dyke brown (76), warm sepia (77), grey (8), silver grey (82) and black (9). 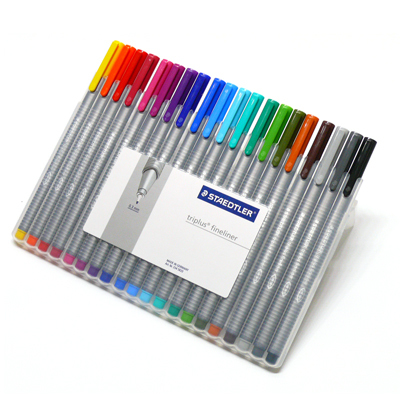 Do you write or draw with Staedtler Triplus Fineliners? What do you like to use them for? 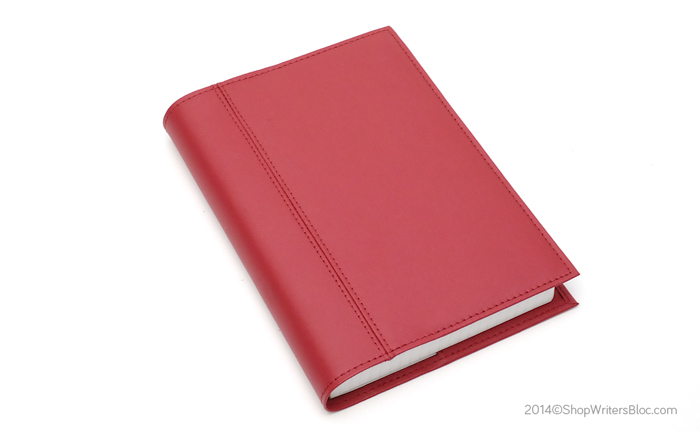 1) Clairefontaine Notebooks. 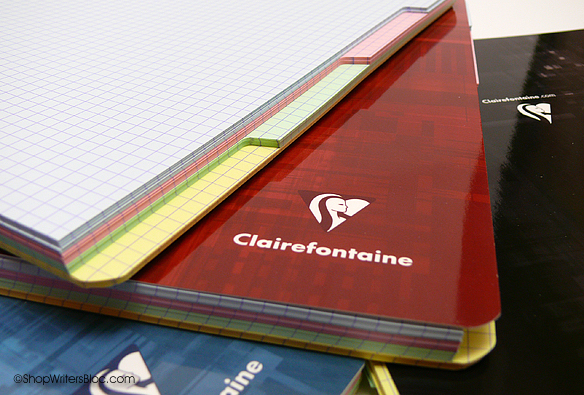 Whatever your paper notebook needs are, Clairefontaine pretty much has you covered with their huge variety and high quality super-smooth paper. 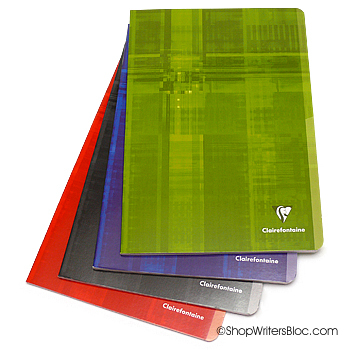 One of our favorites is the Clairefontaine Twinbook. The first 48 pages have a tab cut into them that divides the Twinbook into two sections for two subjects. 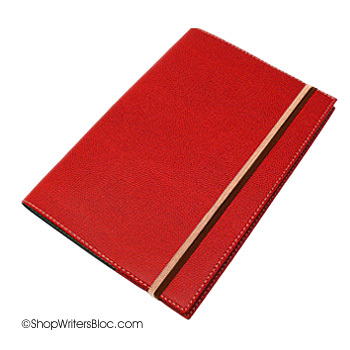 Another favorite is the 3-hole punched Clairefontaine Wirebound Notebook, ruled with margin. 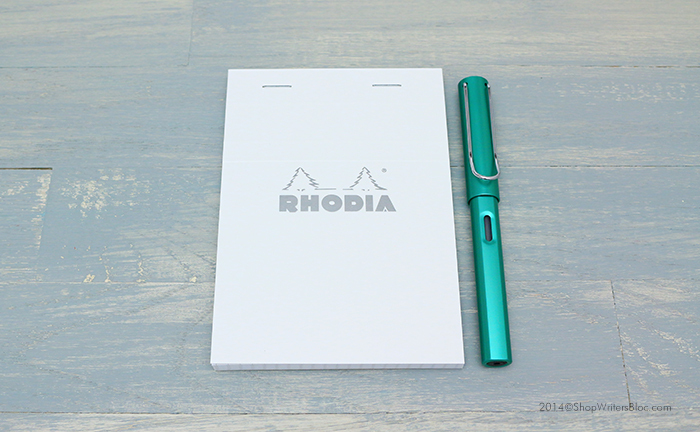 This notebook has paper that is sized to fit 3-ring binders in the USA and includes a generous 90 sheets of paper (available soon). 2) Quo Vadis Academic Planners. Back to school means a busy schedule and lots of exams and assignments to keep track of. 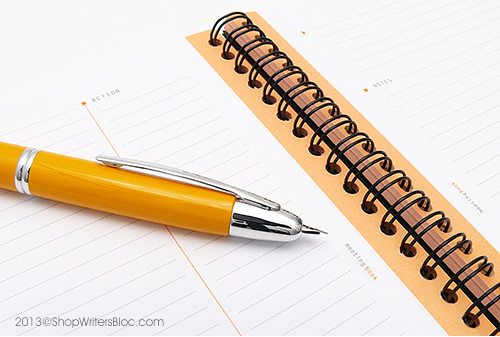 Keep yourself or your student organized with a Quo Vadis Academic Planner that starts and ends with the months of the school year. For a super jam-packed schedule try the Quo Vadis Academic Minister or for something pocket-sized the Quo Vadis University Appointment Book. 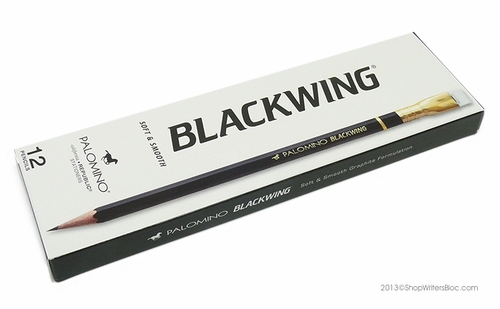 3) Palomino Blackwing Pencils. 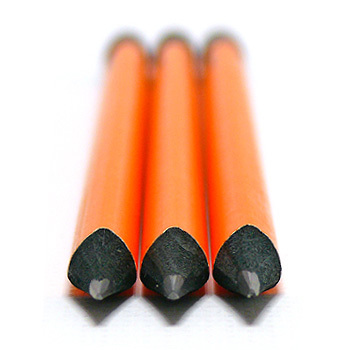 Whether you’re in art class or geometry class a quality pencil is an essential tool. Palomino has got your needs covered with their retro variety of premium graphite wooden pencils. 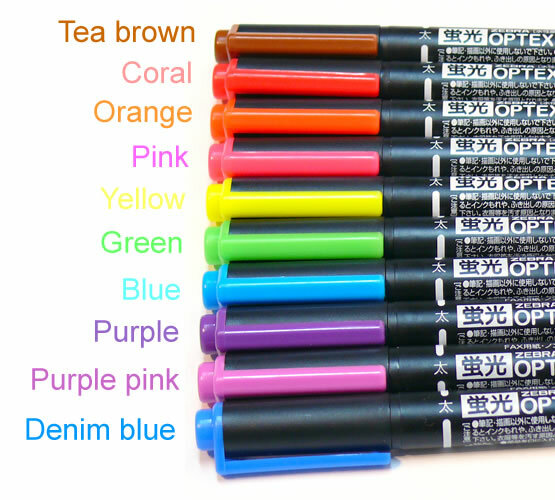 4) Zebra Optex Highlighters. These Zebra Highlighters have a tip on each end: The thick end is perfect for highlighting words on a page while the thin end is great for underlining. Save space (and weight!) 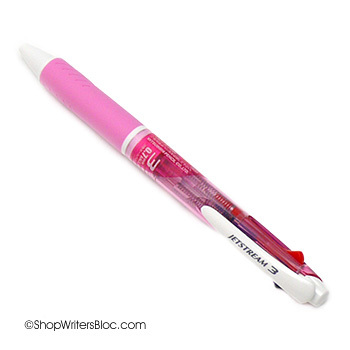 in your backpack with these dual purpose writing tools. 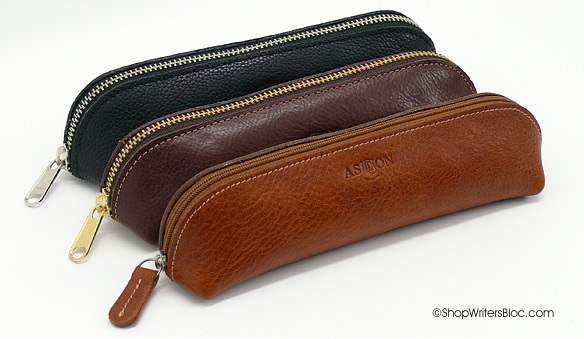 5) Aston Leather Pencil Pouch. 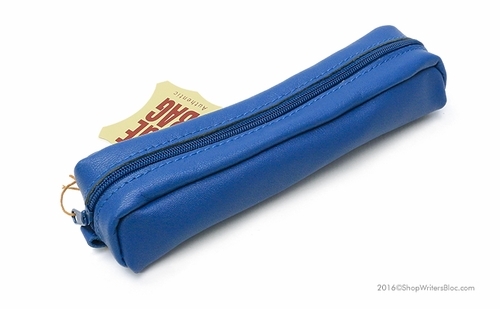 Keep your writing instruments from getting lost in the black hole of your backpack with a rugged Aston Leather Pencil Pouch. Aston selects their leather from the best environmentally friendly American and European tanneries, and their leathers are scratch resistant, supple, and sturdy. 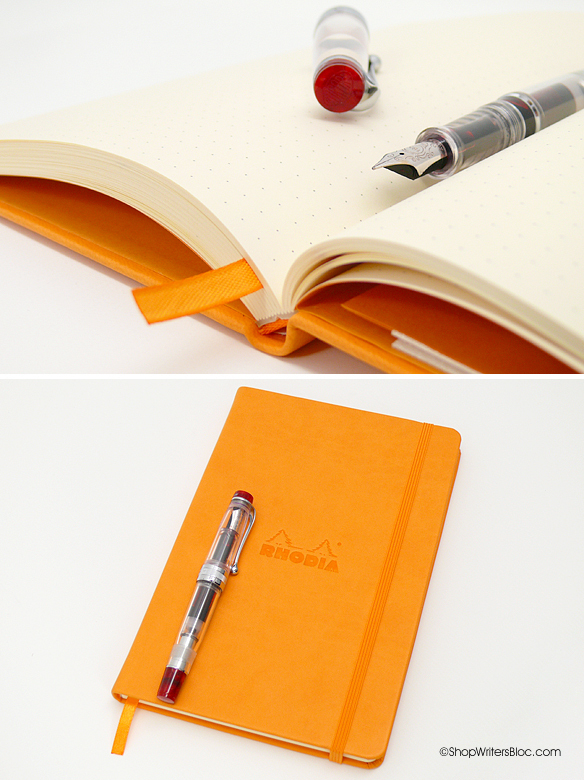 What would you like to add to our list of top 5 school supplies for 2015?